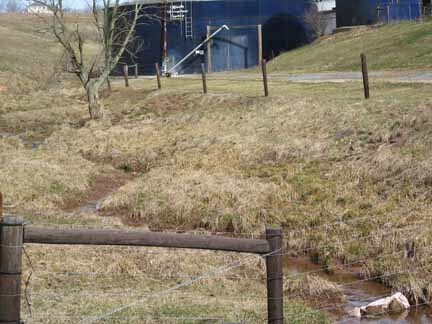 Why should we maintain or restore a riparian buffer? Do: Nonpoint Source Pollution Awareness - What's Wrong with This Picture? Evaluate - How well does your school or a local park manage runoff? 1. What observations can you make to gauge the effectiveness of the efforts? 2. Scientists are organized when they make observations. Develop an observation form. 3. Make your observations - Scientists collect data over time with repeated observations. In doing this, they strive to avoid an incorrect assessment that is based on a one time event. Visual evidence can be very compelling. Collect some by taking digital photos or video taping the runoff. 4. Examine you collected data. Conclude - Are the school's or parks' efforts effective? 5. Based on your findings - What should be done? Identify a riparian area in your community. Assess its biodiversity and viability. Your community is excited about the proposed shopping center. The builder has purchased an "empty" tract of land next to a stream. The project is being promoted because it will mean new jobs and more shopping choices. 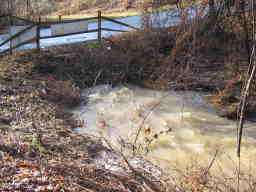 Local environmentalists are concerned about the impact of the development on the stream. Write a letter to the editor or a speech to be delivered at a public meeting that advocates for the preservation of a riparian buffer between the shopping center and the stream. Use lots of facts to bolster your argument. Just Ducky - crossword puzzle / Name that Duck practice / Eagles Evaluation / Lentic or Lotic ecosystem? / Stream Assessment form.